There were other things as constant as the heavens - people’s prejudice, for one. I suppose, any story that is set in a small rural, American town in 1918 will come across as Christian Fiction in its attempts to be historically accurate, so that bit of oversight is on me when I requested this book. Because while I find the plot interesting, I wouldn’t have read this to review had I known. Religion is a tricky thing to deal with in opinion pieces like a book review after all. That being said, it had nothing to do with how I rated this book. 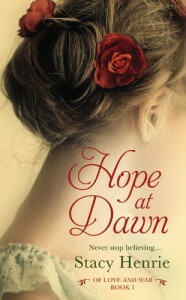 Hope At Dawn is set in the fictional town of Hilden during World War I, when there’s rampant discrimination against German-American settlers among its ‘patriotic’ townsfolk. Their loyalty is routinely questioned, their way of living constantly under suspicion, the law going as far as prohibiting them from speaking in German. Some are forced to buy Liberty Bonds under threat of violence in order to prove their commitment to the American cause. Friedrick Wagner suffers these and more for being granted a deferment from military service because his German father is dying. He meets and falls in love with Livy Campbell, a schoolteacher whose brothers are fighting the Great War in France while she teaches German-American children in American soil. I suppose I ended up appreciating the historical fiction aspect of this book better than the romance overall. The idea of a 6-foot-3, blonde, blue-eyed German-American man suffering from discrimination; of German-owned business establishments being painted bright yellow to warn people off; the racial slurs they openly suffered in 1918 were simultaneously eye-opening and harrowing in so many levels. I liked that this portrayed prejudice both ways, capturing the complexity in that dynamic. Bigotry is such an ugly aspect of humanity to confront from any standpoint and it is a tragedy to acknowledge it being alive and well at a time when you can talk to people halfway around the world with the press of a button. These people rode horse-drawn carriages and drew water from a deep-well FFS, what’s our excuse? I was very hopeful from the blurb, the kind of romance this would deliver. An honourable man left to prove his worth outside serving his country in the battlefield, falling in love with a woman whose family has been torn by the very war he’s not serving. It won’t even take much for me to get emotionally invested from that premise alone, I was expecting a sweeping saga of love breaking boundaries and conquering the ugliness of prejudice. Unfortunately, the delivery felt desperately lacking. The storyline’s progression was very cliched, there were endless sighs of longing, beauty that can’t be diminished by sickness or pale cheeks illuminated by moonlight… it just hasn’t been the kind of romance I’ve been looking for since I was in high school. The writing was serviceable but the emotions this meted out were lukewarm at best. Friedrick stared unabashedly at her, her hair and face lit by the light from the fire. She couldn’t be more beautiful, both inside and out. He’d never loved another person as he did her. He lifted his hand with a sudden need to touch her. While I didn't fall in love with him, I did like Friedrick as a hero, a little too perfect for my tastes but not to the point of offense. On the other hand, I was constantly annoyed with Livy throughout her evolution. By the end, it felt like her ability to overcome her own biases was rooted to her feelings for Friedrick and not something she’s come to terms on her own. There’s a certain degree of calculating coldness in her character, leading me to question her ulterior motives in her acts of kindness. The characters were perfectly nice and good, but with very little complexity and depth in their personalities. The good guy never loses his temper and the bad guys do nefarious deeds with the circular reasoning of because they’re bad. I was always on the brink of disinterest, almost giving up on the story altogether. Seeing as the roadmap to the Epilogue is apparent from the first chapter, this hardly delivered on the aspects of swoon, excitement or intensity. This is one of those books that I feel it is my complete fault for not enjoying. It has evident sincerity in its intent but the delivery just didn’t appeal to me overall. Review Copy courtesy of the publishers. Quotes taken from an uncorrected proof.